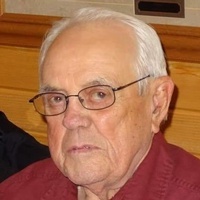 Harlan John Rosenau, 92, of Eldridge, ND, passed away early Tues morning Sept 11, 2018, while under hospice care, surrounded by family. Harlan John Rosenau, son of Edward and Rosine (Wahl) Rosenau, was born in Eldridge, North Dakota on November 20, 1925. He attended Eldridge School until 1943. In 1945, he joined the US Army and spent a year in Okinawa. After returning from the service he farmed with his father. On June 10, 1948, he married Ardelle Hennings at the Eldridge Lutheran Church. Harlan farmed near Eldridge where they raised three children, Rick, Kathie and Kevin. Ardelle passed away in 2014.Farming was his life passion and after retirement he took great pride in his large garden, making sure no weeds had a chance to start growing. He enjoyed watching the garden come up this last year and so enjoyed eating the fresh fruit and vegetables this fall. Harlan couldn’t wait to get out to mow his farm yard each spring, doing so through his 91st year. He loved fishing whenever he got the opportunity and even got out in the boat to enjoy a little fishing in July of this year. Harlan is survived by his children, Rick (Tamera Ward), Lincoln, NE, Kathie (Brian) Lindsay, Jamestown, ND, and Kevin (Deborah), Garland, NE; six grandchildren, Chad, Dane, Troy, Matthew, Jim and Ed; eight great-grandchildren, Andrew, Nicholas, Jack, Isabelle, Thomas, Harlan, Nora and Collin; and sister, Edna Norheim. He was preceded in death by his wife, Ardelle; parents; brother, Raymond; daughter-in-law, Diane; and several brothers-in-law and sisters-in-law. Funeral Service: 10:00 a.m., Monday, September 17, 2018 at St. John’s Lutheran Church, Jamestown, with Pastor Erik Weber officiating. Visitation: 2:00 p.m. to 7:00 p.m., Sunday, September 16, 2018 at Eddy Funeral Home. Prayer Service: 7:00 p.m., Sunday, September 16, 2018 at Eddy Funeral Home. Interment: Sunset Memorial Gardens, Jamestown, North Dakota.